Adjusting Entries utilizes the Profit First method of cash management. Our team is trained and certified by the Profit First Professionals organization to guide business owners and entrepreneurs in maximizing their profits. Any accountant can do your taxes and reconcile your books. But how many accountants will also drive profitability in your business? That’s what we do. 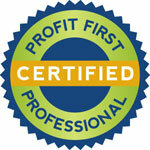 We are a Profit First certified firm. Give us a call (or drop us an email) for a profitability assessment and profit strategy guide. This service is completely free and by the end of our discussion you will be well equipped to boost your profits (fast). Is your accountant stuck in the old way of just doing the books and filling out your tax forms? Then we would love to show you what modern accountants do: They help you drive profitability. Give us a call (or send us an email) for a free consulting session. No strings attached. The author of Profit First has a new book that teaches tip and tricks about time management. Chances are you started a business so you could be your own boss, set your own hours, and bring your unique style to leading a team and solving business problems. In reality, you probably find yourself too bogged down in the daily grind of running your organization to experience the freedom and control you expected. That’s about to change. 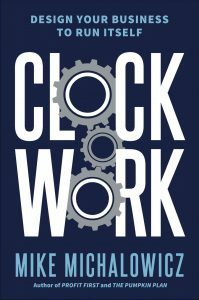 In Clockwork, you’ll discover a simple, counterintuitive approach to creating efficiency that frees you up to pay attention to the things that matter, in life and at work. Regardless if you are a business of one, one hundred or somewhere in between, you will finally have an organization that get things done while you do what you want to do.